It is a bit like an A-frame cabin with lots of very large windows looking out to the pine trees and natural surroundings. They are a popular venue for weddings and funerals alike. They seem to be a very open and inclusive church, believing (quoting from their website) ‘that through joyful worship and grace-based fellowship our hearts will be changed.’ They put on a variety of special events such as a Christmas pageant, outdoor procession on Palm Sunday, outdoor sunrise service on Easter, ‘pot luck Sunday,’ etc. They also offer Bible study and support a variety of charities. There is one service each Sunday. Mt Baldy is an unincorporated community located in California’s San Gabriel Mountains about 40 miles northeast of Los Angeles. Mount San Antonio, the highest peak in the San Gabriels and called Mt Baldy by the locals due to the absence of trees at the summit, gave the community its name. The area is popular with hikers in summer and skiers in winter. 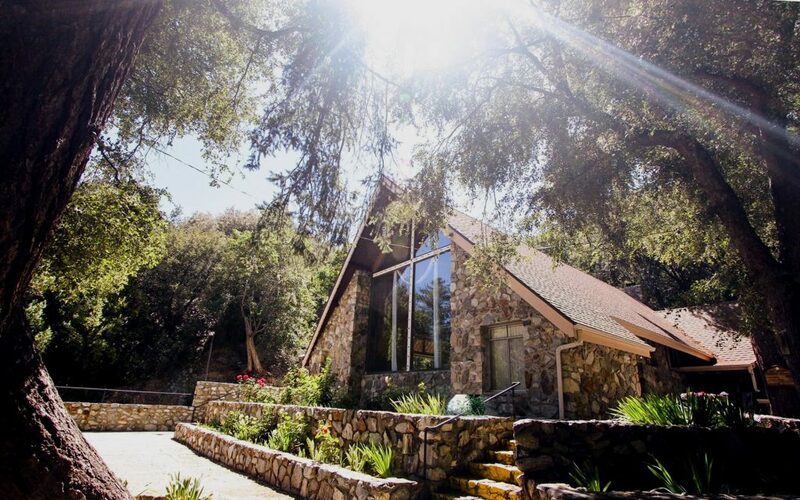 The church sits just inside the Angeles National Forest. The immediate neighborhood is something of a ‘destination’ for bikers and nature lovers. The worship leader played piano and would comment and pray between songs. He was also the one who greeted us after the band finished practicing minutes before service. The pastor did the announcements and preaching. Full. It seems to be mostly locals, middle aged, artsy, relaxed people. Some of the members, as well as attendees (like us), drove up from the flat lands about thirty minutes away. We arrived a few minutes before service and just sort of made our way to the coffee station. It was there that the gal in charge stepped in to make sure there was plenty of coffee. We chatted briefly with her and fellow coffee loiterers. Once we entered the sanctuary we were greeted by several regular parishioners. Yes, the pew was comfortable. Nothing much to report. There were blankets at the end of the pews because, apparently, it gets cold in the church. Those may just be vestiges of the recent past, as the pastor alluded to them and mentioned the facility’s heater. Upon entering the church, we noted that the band was still practicing. People were seated and chatting in the reception area (which is just an open space to the open sanctuary). When we sat in the pew, the church had maybe 40 people milling about. The service started a few minutes late, but by the time it was in full swing, the small church was full (maybe 100 people). The Holy Bible, New International Version, was in the pews, along with the Celebration Hymnal. The Bible was unnecessary as all the verses in the message were printed out and placed in the bulletin. Mrs Hungry Hopper referenced the hymnal to sing harmony, but there were no references in the bulletin to the hymn numbers, so she only found one of the projected songs and it was so simple she closed the book after one line. Piano, guitar, recorder, harmonica, drum. Nothing was especially distracting. There were a couple of mentally challenged people in attendance who would speak loudly during service, but it wasn't much. There were also small animals that we could see outside the windows, and they were momentarily distracting during the sermon. The worship was enjoyable. Most of the songs were known to us, as they were hymns and older praise songs. The first song was the only one that wasn't all that great, but there was a variety of pace throughout. One song was rousing with a mountainy flair, the others more mellow, and some evoked a clapping response at the choruses. Unfortunately, this is the one thing we forgot to time. I would guestimate 40 minutes. 7 — The pastor came off very personable and pastorly. He was friendly, and he preached at pew level without a podium. He did follow a handout for his sermon, which included twenty-four – count ‘em, twenty-four – scripture verses. It was a lot, and it took some concentration to follow, but there was the continuing theme of ‘simplification’ upon which he was focused. I'm not sure the sermon was as ‘simple’ as the message point. The sermon, it seems, was about our work in Christ as people made with purpose. We work for God, and living right and working for him expresses the simple message of Christian living. The atmosphere and the singing were all very nice. We liked knowing the songs and being able to sing along, and the bright interior and big windows looking out at nature provided a very comfortable and spiritual feel. The bulletin was frightfully busy. Everything was yellow highlighted, everything was in a box, there were too many fonts, and everything was bulleted. It was difficult to look at. I would say they need to stick with a single color, no more than two fonts, and abbreviate as much as possible. They need to see another church's bulletin to get a better fix on what one should look like if they wish to convey information. Hey, this can easily be Googled. More people introduced themselves and told us about future events of which to be aware. Invitations to keep coming were many. So far as we know, the main coffee time was before the service. It's not great coffee, but it's coffee, and it gets served in styrofoam cups that could be taken into the service. After the service, there just seemed to be too many people in the building to get back to the coffee station (if it was even still brewing). 10 — Easter is nearing, and the church seems to have some creative ideas for that celebration. As we generally enjoyed our visit, we may well make a reappearance, especially for the holiday. Yes. The worshippers seemed sincere; the pastor pushed biblical verses to maintain the points of his message; most of the songs were meaningful to us. I would not have been ashamed to bring a nonbeliever here. The venue. The place itself sort of dictates the style and program. I suppose it could be otherwise, but the atmosphere and presentation just seem to fit.